We call this buck the “Latrine Buck.” It was trying to be bold, going by one of our wall tents. Unfortunately for it, Ken was sitting outside on the latrine when it came by. This past hunting season — 1997 — did you get that buck with the enormous antlers that you talked about all last summer and fall? Chances are you didn't. I've been in the same boat many times. Oh, I generally take a nice buck, one 3-1/2 years of age or older, but the buck I usually dream about before the opener is still running free after the season ends. While talking about the latest of intended quarries a few days ago, it occurred to me that I was repeating words and phrases used during seasons past. This started me thinking. I have often discovered the same words and phrases in the hundreds of letters I have received from hunters seeking advice on how to take large bucks. Included in many of these letters were home-made maps with Xs indicating the many spots where these bucks were sighted. 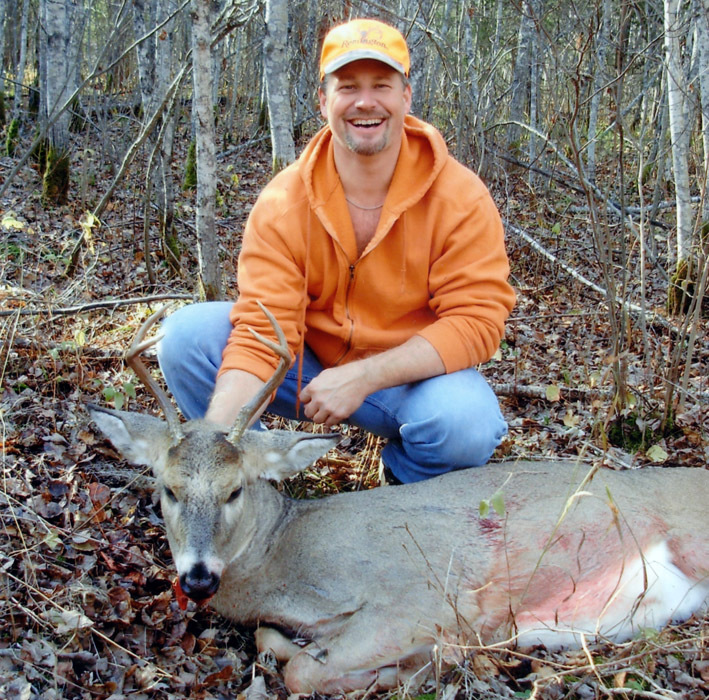 Moreover, practically every experienced hunter I know has seen a particularly large buck several times, has devoted one or more seasons to hunting it, and has failed to take it. As I finally realized, almost every tale of this kind has a common paradox: adult bucks that prove to be invincible are uncharacteristically bold and often seen. Most of the larger bucks I have studied or hunted were extremely wary animals, rarely seen, if ever, until finally outfoxed by a superior hunting ploy. Wary as they were, my partners and I have long been most successful when hunting adult bucks we've never seen, locating them and places to hunt them via deer signs alone. Conversely, though you'd think bold, much-seen bucks would be “easy” quarries, we have never succeeded in taking a 4-1/2–6-1/2 year-old buck that was often seen before a hunting season, nor have we ever succeeded in taking a 4-1/2–6-1/2 year-old buck that often approached within 100 yards of our camp during a hunting season. As revealed by their fresh, identifying tracks and droppings, several big bucks I have studied during hunting seasons have gone out of their way to visit my deer camp. We call such bucks “camp bucks.” Over a ten-day period the big 10-pointer I hunted this past November approached very near my camp on three occasions, twice within easy bow range. Its first visit might be attributed to “error” or “curiosity,” but what about the second and third visits? Unlike sometimes foolish fawns or yearlings, older, experienced bucks do not ordinarily court danger in this manner. Then what was the buck up to? The actions of a big buck I hunted ten years ago, also without success, makes me believe this 10-pointer was actually demonstrating something of a loftier nature: extraordinary cunning (extraordinary animal intelligence). The earlier buck regularly bedded within a patch of dense alders 200 yards southwest of my camp. It's two favorite feeding areas were short distances north and northwest of my camp. To get to these feeding areas, it had to cross a logging road in front of my camp. Its daily challenge, then, at least during daylight hours, was to determine when and where it could safely cross this logging road. As revealed by its tracks in snow, this buck regularly went out of its way to determine where we Nordbergs were sitting in tree stands, circling our stand sites widely downwind each morning or evening, identifying us via airborne scents without being seen. Once done, it would then cross the road at a site a safe distance away from the nearest hunter. On weekdays I hunted this buck alone. The first day alone, I decided to sleep late. About 9 AM, I awoke to the sound of a branch snapping loudly behind my camp, in the vicinity of a ground scrape made by this particular buck (the dominant buck of the surrounding square-mile area). 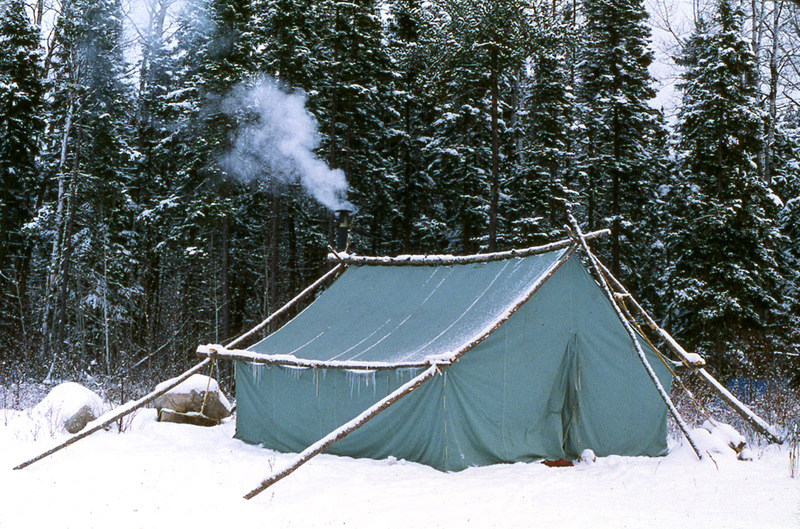 In stocking feet and long underwear, I slipped from my tent and stalked cautiously through the thick spruces behind camp toward this scrape. Shortly, the staccato hoofbeats of a fast-moving deer came from the frozen logging road out in front of camp. Sure, enough, the tracks in the road indicated the fleeing deer was the buck I hunted. Upon not finding me at one of my usual stand sites, it then seemed apparent, the buck visited my camp to determine whether or not I was there. “Could a white-tailed buck actually be that smart?” I wondered. Thereafter, on the days I headed to a stand at my customary pre-dawn hour, the buck did not visit my camp. On the two mornings I remained in camp, hoping to ambush the buck there, it approached within fifty yards by 9 AM. Each time, however, it remained within dense, downwind cover. I could hear it, but could not see it (track lengths later identified it). From that time on, I've had a great respect for the intelligence of adult white-tailed bucks, especially “bold” adult white-tailed bucks. Unusual boldness on the part of adult bucks with enormous antlers typically kindles considerable excitement, yearning and feverish preparations among hunters who witness such behavior. Such boldness, however, does not make adult bucks easy quarries. Quite to the contrary, it is a sign of extraordinary savvy when it comes to dealing with humans. It reflects an experienced buck's ability to recognize when a human is hunting, therefore dangerous, or not hunting, therefore harmless. It reflects familiarity with the habits of humans who have hunted in its range two or more years, including your habits. It reflects the fact that such a buck recognizes you and your intentions via sight and your sounds and odors. It reflects the recognition of your abilities as a hunter and when and where you prefer to travel and sit while hunting, enabling the buck to live a relatively normal and safe life within sometimes unbelievably short distances of trails and sites you frequent during a hunting season. Thus what might seem like boldness in an older buck is not really boldness. It's well-founded confidence — confidence in its proven ability to avoid danger from you and other hunters. Does this mean you should not waste time hunting adult bucks that seem especially bold? I'd be a fine one to say “yes.” I have never been able to resist hunting a camp buck, and I doubt I ever will. Though I realize my efforts are apt to fail, I intend to continue to hunt big bold adult bucks as best I can and enjoy the special anticipation and excitement that goes with such undertakings. However, I will never make the mistake of limiting myself to taking big bold bucks only. Whenever a lesser buck, 3-1/2 years of age or older, wanders near, I will not hesitate to take advantage of the opportunity to harvest some tasty venison. Though you may not agree, yet, a mature buck in hand is worth any number of big bold bucks in the bush.